Bioenergy crops have the potential to enhance energy security and help meet the required reductions in greenhouse gas emissions. Bioenergy provides around one tenth of global primary energy (energy contained in raw fuels). Increasing this contribution is difficult with first generation biofuels, such as bioethanol and vegetable oil, because they compete with food crops for arable land. Second generation biofuels overcome this problem by using non-food biomass, such as woodchips, which grows on land not suitable for arable farming. 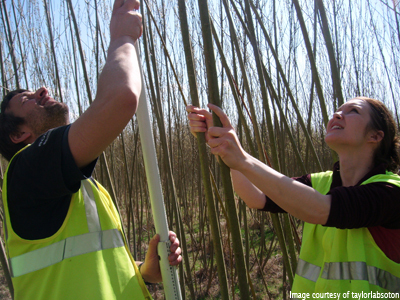 The Forest Growth SRC project have developed software that predicts the yield of biomass that can be grown in an particular area. They are working with the Software Sustainability Institute to improve the speed of execution and the ease of use of their software. Woody biomass, such as poplar (Populus spp.) and willow (Salix spp.) is a bioenergy feedstock that can be grown widely across temperate landscapes. The Short Rotation Coppicing (SRC) technique takes advantage of the fact that the trees make new growth from the stump after being cut down. Harvests take place on a two to five year cycle. Forest Growth SRC is a model for predicting the yield of woody biomass from an area of land. It was developed jointly by the Centre for Biological Sciences at the University of Southampton and Forest Research (the research arm of the Forestry Commission). Hundreds of different biological processes contribute to yield, such as photosynthesis, light interception and the way the plant uses carbon. Forest Growth SRC models all of these processes and uses them to predict their effect on yield. The project's co-ordinator Prof Gail Taylor approached the Software Sustainability Institute as part of the Open Call looking for help improving Forest Growth SRC's scalability and usability. Running the model over a square kilometre takes about a minute on a fast desktop PC, but much larger areas are required for biofuels. Scaled up to 100,000+ square kilometres (the area of the UK), with ranges of starting inputs for temperature, precipitation and CO2 levels, and very soon a run takes many days to complete. The Institute has begun work to get the code, written mostly in FORTRAN and targeted at Windows, to run on Linux so that it can be deployed on the University of Southampton's IRIDIS4 cluster. This will allow the parallel execution of many dozens, or even hundreds of model runs, massively reducing the time needed to run a simulation of a country-wide area. Each execution of the model requires many carefully crafted input files describing factors like meteorological and soil conditions, and produces a raft of small text files as outputs. A complete run can easily produce hundreds of thousands of these outputs. In the coming weeks, work will begin on marshalling these inputs and collating the outputs to make large-scale runs more feasible. Further work will concentrate on improving the usability of the software, which due to its command-line nature and esoteric inputs has a high barrier to entry, discouraging casual use. Ultimately, the goal is not only to make Forest Growth SRC more powerful, but also to encourage more users to adopt the software by making it easier to use.